Either someone who has worked with a financial advisor steers their friend, family member or colleague toward that advisor, or the advisor markets himself through advertisements, seminar appearances, social media posts or cold calls. The value of referrals is two-fold: not only does the investor get the name of a financial advisor, the referral usually comes with a recommendation, which is vital to the initial level of trust the investor has in that advisor. For advisors, the message seems to be clear: get your clients to recommend you to others if you want to increase your client list. From an investor’s standpoint, referrals are tricky. The investor is definitely relying on the advisor to perform well for the client the investor steered their way. Otherwise, that friend, colleague or family member could end up being an unhappy friend, colleague or family member. But that is exactly why referrals are so valuable. Investors are so secure in the knowledge the advisor is honest, trustworthy and capable that they do not mind sharing that advisor with others. It’s the strongest recommendation an advisor can get. However, a surprising number of investors find their primary advisor in other ways. Spectrem’s 2016 quarterly study on affluent investors - Advisor Relationships and Changing Advice Requirements – examines the manner in which investors first become aware of the advisor the work with. Referrals are responsible for only 53 percent of relationships among Ultra High Net Worth investors with a net worth between $5 million and $25 million (the percentage is lower among investors with less wealth). These referrals most often come from business associates, although that is most often true among older investors. Millennials and Gen X investors most often got referrals from their parents. Where it came from is not as important as the fact that referrals carry weight. Investors most likely would not refer an advisor unless they had trust in that person and believes they can properly assist the person receiving the referral. (It is noteworthy that many UHNW investors (more than 30 percent) do NOT refer their advisors to anyone. Whether it is because they don’t want to be responsible for an advisor’s performance or just don’t want to get involved, referrals are not automatic. So, if advisors only get 53 percent of their investors from referrals, where do the rest come from? They come from cold-calling, or at least the 21st century version of cold-calling. 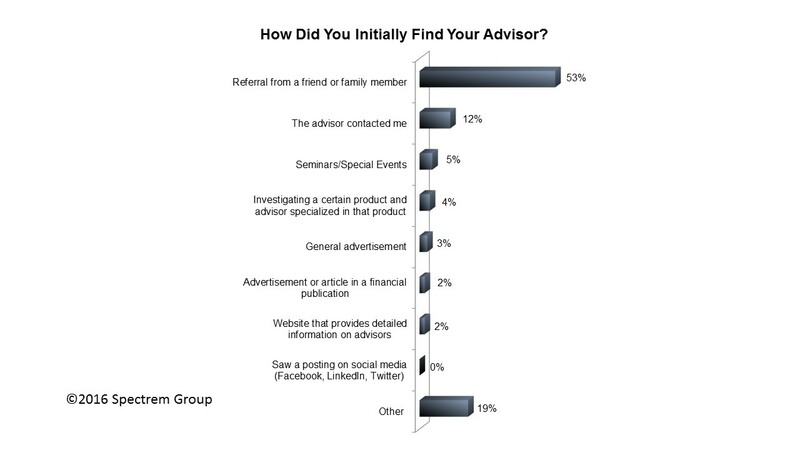 In the UHNW study, 12 percent of UHNW investors said the advisor contacted them first. Those contacts may not be what “cold-calling” used to mean, in which an advisor would just dial a random phone number and hope for the best. The advisors probably have some reference point they use to make the phone call, whether it is a simple search on LinkedIn or some other social media site, or culling a name and contact information from a successful company website. Still, advisors who reach out to clients not expecting to hear from them sometimes succeed in making a match. Other forms of communication (seminars, advertising, a chance website search by the investor) are only marginally successful. But an advisor looking for more clients cannot consider any avenue as a waste of time. It may not be proper for advisors to ask for referrals from clients, but it is not inappropriate for advisors to suggest referrals. “If you know somebody…” is not the worst way to start a sentence. At the same time, it is not improper for advisors to ask how investors decided to make contact with them in the first place. If they arrived via a referral, it can be very informative to find out which clients are satisfied to the point they refer your services to others. If you are too busy to consider outreach for clients, congratulations! But if you have time to dedicate to selling yourself, all methods are worth consideration. When you find out that an investor found you through an advertisement of some kind, you will have strong cause to maintain or even increase use of that advertising vehicle.